I was reminded of the fable of The Ugly Ducking when I saw footage of Chelsea Clinton the other day. Who would have thought that the geeky teenager who sharpened her pencils on the White House lawn would blossom into such a foxy chick! Well, perhaps more squirrelly than foxy, but you know what I mean. I have Chelsea to thank for an amusing incident that occurred shortly after I returned to the jungle in ’97. I practically chortled my head off when a chimpanzee asked me why the American president had named his daughter after an English football club. I later warned the chimpanzee to stay clear of the place, if he ever visited London, to avoid having his picture taken with D-list celebrities. These desperate people will stop at nothing to appear better connected and more intelligent than they actually are. By all accounts, Miss Clinton is giving bravura performances across the prairies and cornfields of America, in a valiant effort to rescue the faltering presidential bid of her ambitious, steely-eyed mother. I’m sure she’s a natural at the art of working crowds, much as her old pappy used to be. I only hope she isn’t giving the folks too much speechifying at the expense of pressing the flesh. As a girl who started ballet lessons at the age of four, she must be capable of some wonderful stunts in a leotard. Being an intelligent woman doesn’t mean people won't admire your tight little tush. “If you’ve got it, flaunt it!” as a famous orang-utan once said. Will Chelsea ever run for office herself? I don’t see why not. She’s clearly a chip off the old block who knows how to pull strings and inspire the voters. 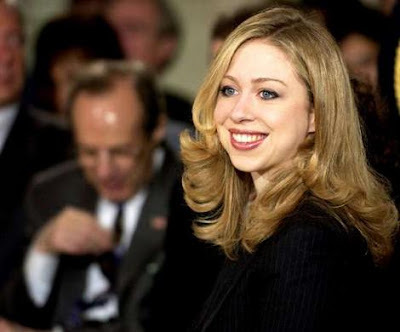 A lot of Americans are fearful of political dynasties, but a smart girl like Chelsea won’t repeat the mistakes of her wayward daddy. I very much doubt she’ll be tempted to let some keen young college boy give her oral pleasure in the Oval Office. And even if she did, she’d be smart enough not to get caught. Picture the scene: President Chelsea is lying on her desk, sighing deeply with legs akimbo, having been slurped to satisfaction by a floppy-haired intern. She slides off the smooth, moist surface and pulls up her knickers, watching the young gallant comb his tousled hair. Her sharp eyes notice a wet patch on the young man’s collar and she instantly recognises the danger – that incriminating discharge would be catnip to the polecats of the political jungle. The shirt is laundered and all traces of presidential DNA are removed. The one thing Chelsea should do before entering politics is make up with Monica to show the world there’s room in her heart for forgiveness. 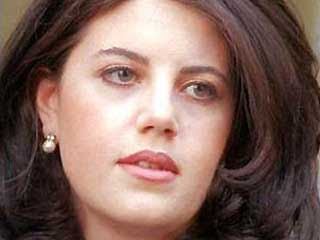 Some thought Miss Lewinsky was an airhead and a hoochie for doing what she did, but I was never one of them. I’ve seen enough of humans in love to know that their hormones have staged a coup d’etat on their brains. Monica has suffered enough for her sins, and having Chelsea over for a slumber party would mean so much to her. As is written in holy scripture: And the wolf shall dwell with the lamb, and the nymph shall lie down with the billy goat’s kid (Isaiah 11:6). It isn’t often that an important politician visits our corner of the Congo. I make haste to the safari guesthouse on learning that the interior minister of Latvia has arrived. For those of you who’ve been neglecting affairs in the Baltics, Mr Mareks Seglins has been ordered by his president to tour the world on a “cultural sensitivity” sabbatical. This is to atone for his racist outburst at the behaviour of British tourists in Riga, who urinated on a hallowed monument of his nation. I find Mr Seglins sitting by himself at the far end of the bar, sipping his drink as inconspicuously as one can. He looks surprised when I greet him by name, his eyes darting suspiciously around the room. 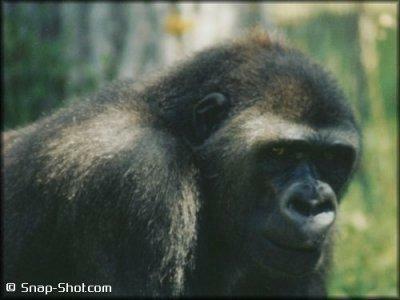 “How you know my name, Gorilla?” he asks. “You call the monkeys ‘pigs’?” he inquires. “Next time I call him ‘bastid son of dog’!” he says with a wicked grin. I accept his compromise and wish him a pleasant stay. I’m pleased to say that the British tourists I’ve observed on safari have generally behaved impeccably. The manager’s theory is that the cost of these tours keeps out the riff-raff, but I tut-tut such snobbish conjectures. My hunch is that their laudable conduct arises from being placed in small, mixed-nationality groups. This makes them keen to avoid incidents that would cause foreigners to snigger at them behind their backs. In addition, the only grand monuments outside the safari camp are elephants, who are difficult creatures to pee on and apt to hold grudges against those who attempt to do so. The root cause of the Latvian incident appears to have been over-consumption of alcohol, once described by a Presbyterian minister as “poison from the udders of the cloven-hoofed beast”. Perhaps British tourists should be asked to tick a box, on arrival at their destination, indicating whether wanton intoxication is an objective of their visit. If so, they might be offered accommodation in a gated resort packed with night clubs selling cut-price booze, and restaurants serving wholesome dishes such as egg-and-chips, curry-and-chips, and possibly beaver-and-chips for the more adventurous. Needless to say, the public spaces would be peppered with fountains and sculptures that could serve as open-air urinals. Should tourists be viewed as ambassadors for their country, as the Latvian minister appears to believe? If one compares humans with crocodiles, it is obvious that the reptiles are far better at representing their species, as they are uniform in their habits and rarely behave out of character. The human population, on the other hand, is subdivided into many strains, including a sizeable contingent of buttheads who rejoice in advertising their coarser traits. Life would be so much simpler if these people were given a country of their own, in the broad open heartlands of Greenland or Siberia. 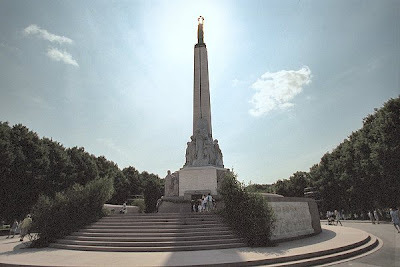 Until such time, the hapless Latvians will have to get used to holding their tongues and washing their public monuments with a powerful detergent.